The Most Incredible Finishing Lap In A Relay You Will Ever See | JustRunLah! May 11, 2011. The baton is valuable in all relay races. 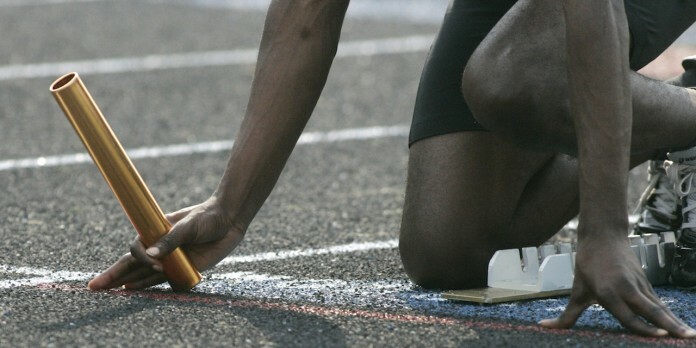 Here a track athlete prepares for the start of a relay. The GWOC track meet took place at Fairborn High School. 21-year-old Irish sprinter Phil Healy emerges from “the depths of hell” last weekend in the women’s 4x400m relay at the Irish Universities Track and Field Championships to bring her UCC team from fifth to first in the final 100 meters. You may skip to 3:05 of the video to watch the final lap of the race and the squealing commentary at the end was absolutely entertaining. On the last lap, Healy was the fifth runner and overcame all odds to come in first. This is a tremendous display of the spirit in running — to never give up, and to give your best.